Whilst the snow may have brought Heathrow to a standstill, flying operations have not been brought to a complete halt at Booker. 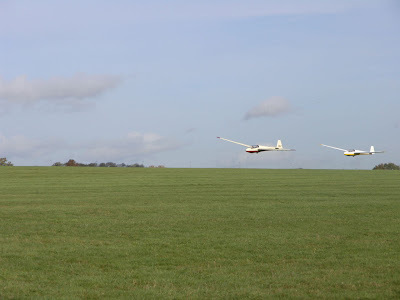 The gliding club managed to have the first fixed wing launches for a week earlier today (but do check with the office for normal flying operations). 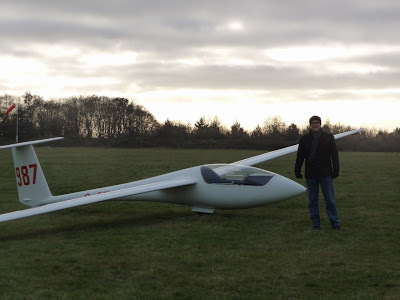 Will Ellis stunned us all with his aptly named "Blizzard" glider as it roared around the skies blending with the sky, snow and cloud in equal measures - mean piloting. Will H then tried out his ski equipped ME109 - on this occasion the camouflage made it easier to see. Brilliant fun until the freezing cold stopped play. Great news - we are through the Winter Solstice, time to get ready for next seasons flying! 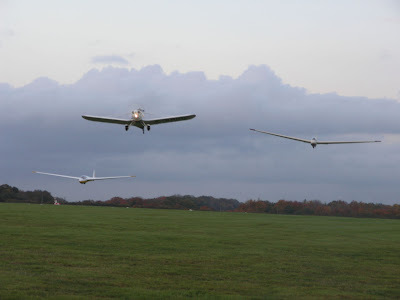 Don't let anyone say that flying slows down or stops over the winter. The weather this weekend has allowed flying to carry on as usual (and with several members using their winter soaring ticket - if you haven't got yours yet its not too late, just ask in the office). The better weather and sunshine on Sunday enabled Phil Binee to get several training flights in with Richard Crockett and culminated in his first solo. Not to be outdone Nik Markert also converted to the Pegasus. Congratulations to them both. 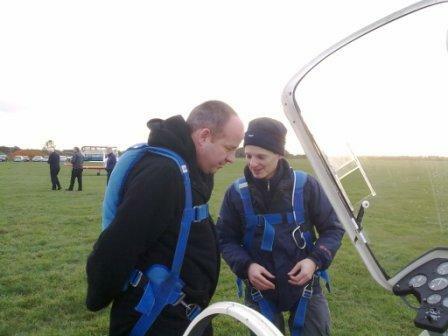 The rest of us just enjoyed the flying - even if it was a tad chilly. 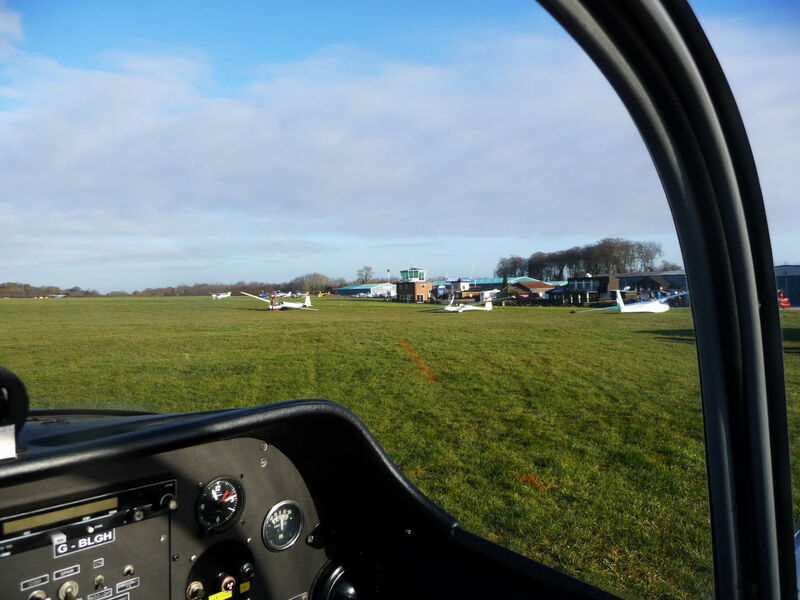 After a week of sub zero temperatures, the snow and the fog finally cleared to allow frustrated pilots to get back in the air again to enjoy the great visibility and the fog that had hadn't cleared over the Oxford plain. 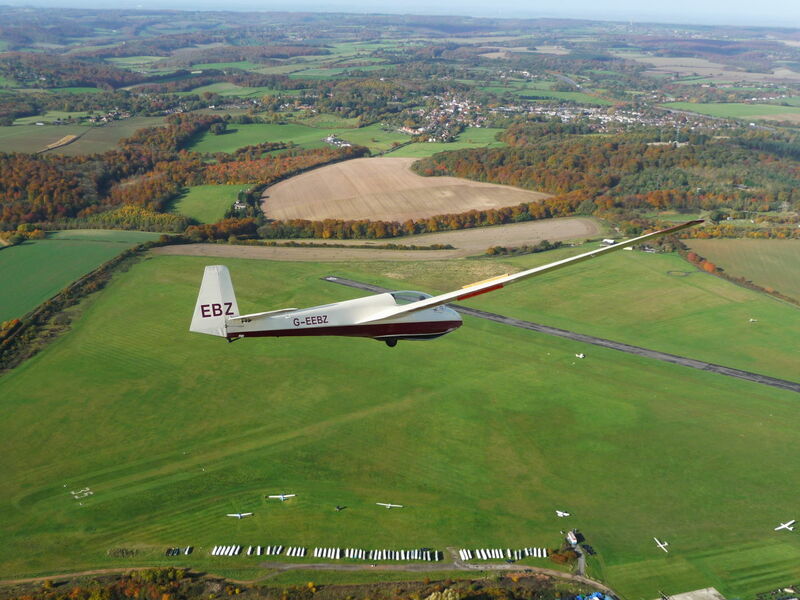 Don't forget the Club's Discounted Season Ticket - for only £200 you get 6 single seater launches and one 2 seater launch to 2,000ft all with free soaring, a great way to keep current and be ready for next years season. Details are in the November Newsletter or ask at the office. One of Booker's best - "Now what do I do?" Many thanks to Richard C and his team of leafletters who spent Saturday spreading the word about the plan to close Wycombe Air Park and build a huge stadium and 800 houses. 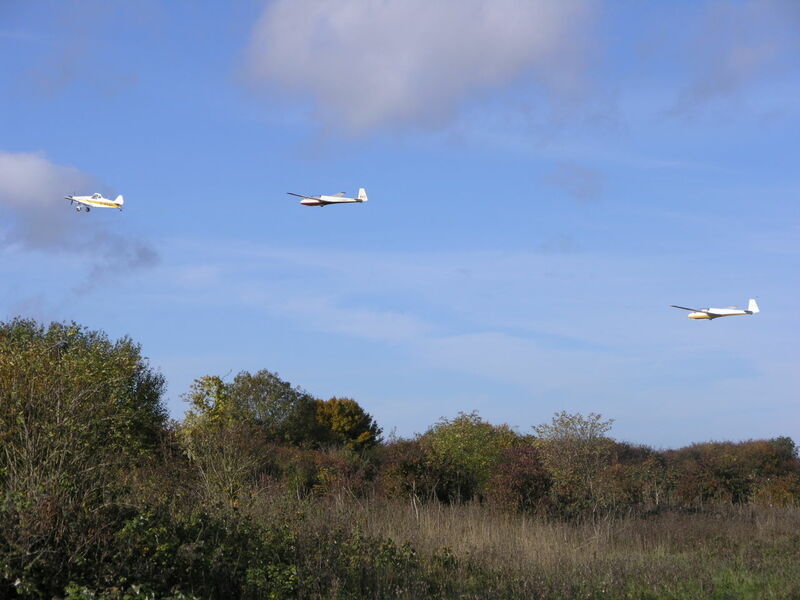 They covered Lane End, Marlow Bottom and Clay Lane, delivering about 700 of our Buzz Off leaflets along with a special offer to our neighbours of a discounted Trial Lesson, with a percentage of the price going to our fighting fund. 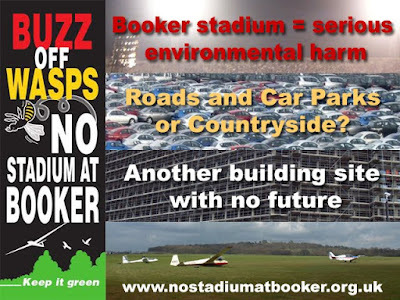 Visits to our campaign website www.nostadiumatbooker.org.uk increased over the weekend which suggests that the leaflets were read. We have plenty of leaflets left so there will be more opportunities to get involved. Maybe we should have given it a scrub first, but here's the Junior trailer expressing its opinion about the stadium proposal. It's been for a bit of an excursion already, around Handy Cross a couple of times and through Marlow. I'm sure it will be out and about again soon. The Club was visited on Saturday by Steve Guy the Liberal Democrat Group Leader on Wycombe District Council and member for Totteridge. 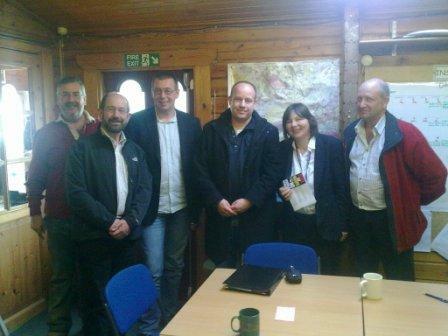 He was accompanied by Councillor Julia Wassell Lib-Dem member for Bowerdean and Ian Morton Lib-Dem agent. They discussed the proposed Stadium project with Club Chairman Geoff Tabbner, Jim, Denis, and Geoff. They expressed their opposition to the scheme on financial grounds. 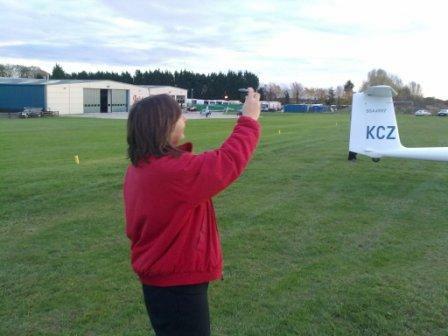 Following the discussion Geoff managed to sell them trial lessons which they flew in the K21. In line with sentiments expressed at the EGM to find new ways of developing skills and flying in new and different locations, the launch point was privy to some dual tow launches followed by some planned formation flying. This seemed to generate a lot of interest from the members at the launch point and more is planned for the future. The following pictures give an idea of what went on. 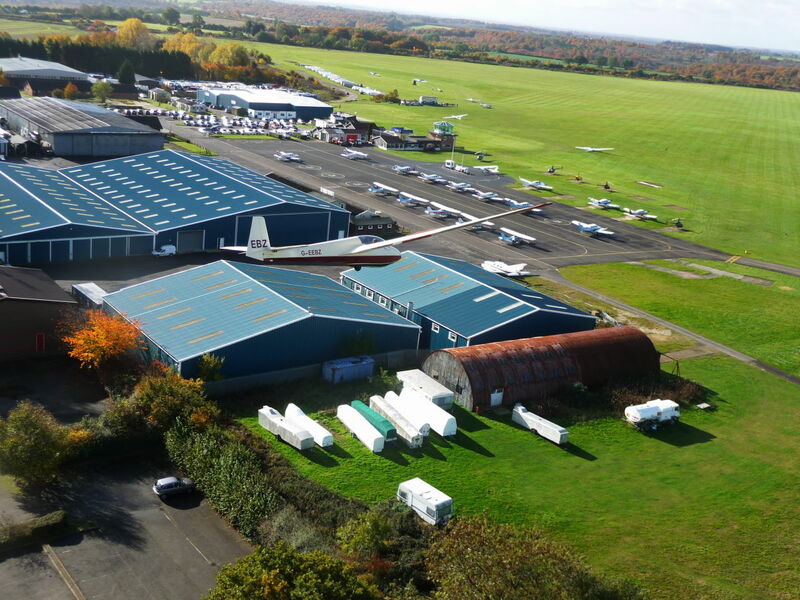 Dual towing is a useful skill to have experience of, let the office know if you are interested and we can organise some more at a suitable time. 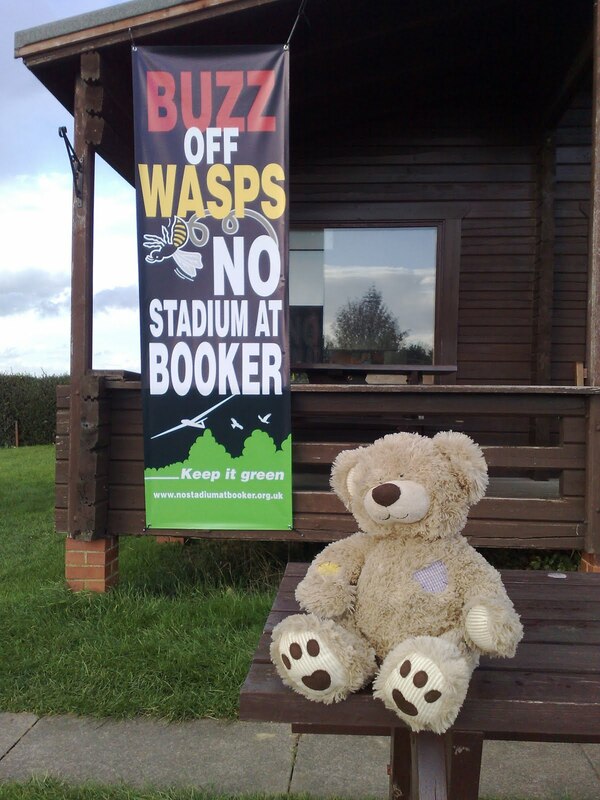 A local resident, who prefers to remain anonymous came along to support the Club's protest against building a 20,000 seater stadium in an Area of Outstanding Natural Beauty. "This monstrosity will kill off the local habitat and destroy the resident wildlife" said the caring bear. Change loop time to view the actual camera images. Image also geolocated on Flikr and Panoramio. If members or readers have any time, money, or skills to lend to the effort please let us know at the club. All welcome. ps: I haven't had so much fun since I was rebelling at university!! 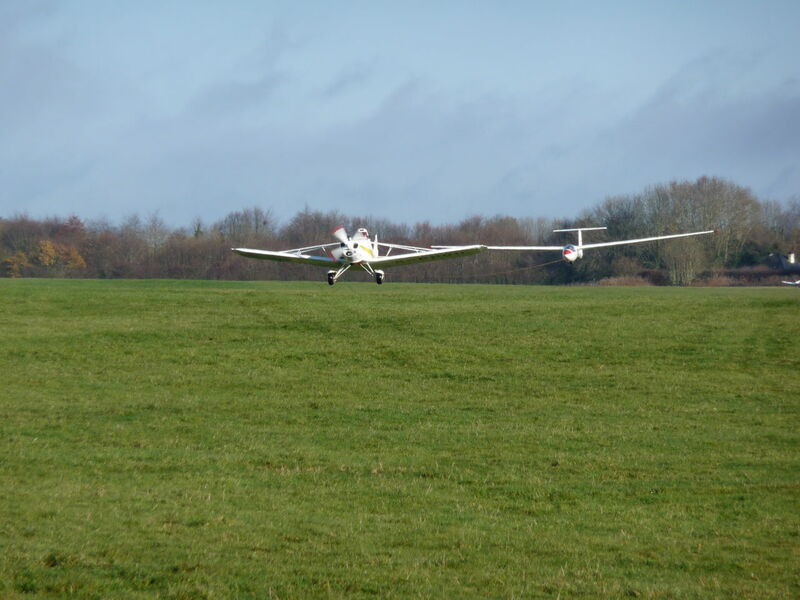 AJ, JIM and T6 launched around midday for a romp on the local ridge. To start with it was working to 800' consistently so we wandered off to Halton. 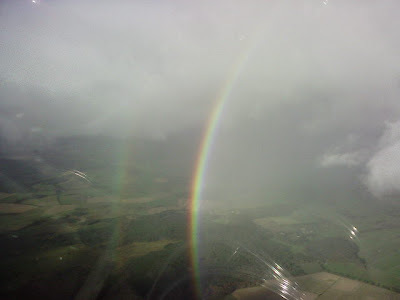 Sadly we had all of 5 minutes on that ridge before clearing for their NOTAM so left at around 1000'. We meandered past Wendover where not a lot was happening, and left the white cross at Princes Risboro' at around 600' for Scotty's house. JIM and T6 arrived at rooftop height and less than 200' but persistence worked out and we scrabbled back above ridge height, picked a therm and cruised back to Booker. A grand day out even if the clenching was pronounced at one or two points. 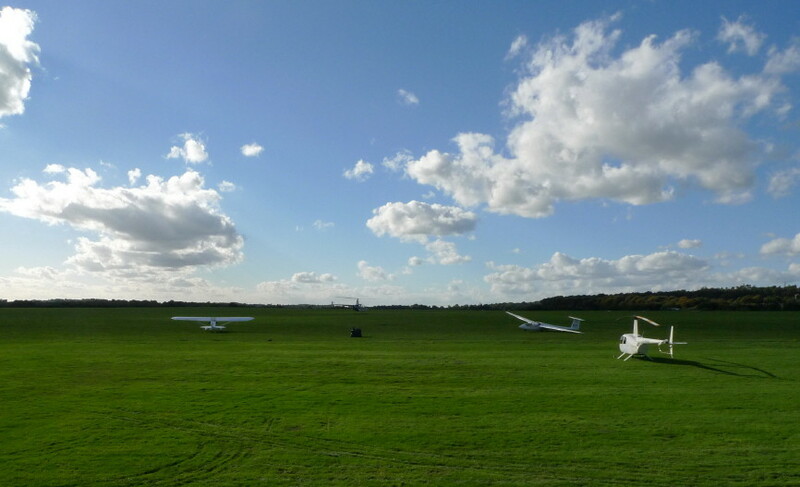 This weekends weather has been good compared to some of the recent wet and windy weekends at Booker and the sunshine brought lots of members to the airfield and resulted in a bevy of launches and several soaring flights today. 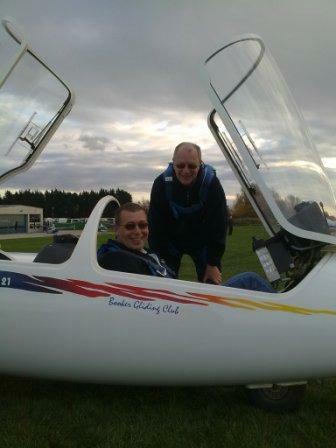 John White also added his name to the list of first solo's today after Paul Clarke decided the time was right to get him off on his own - congratulations John. 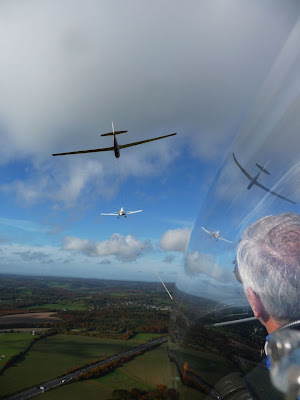 In line with the recent theme of flying reports from members flying elsewhere (or should that be eating and drinking around Royal Deeside?) 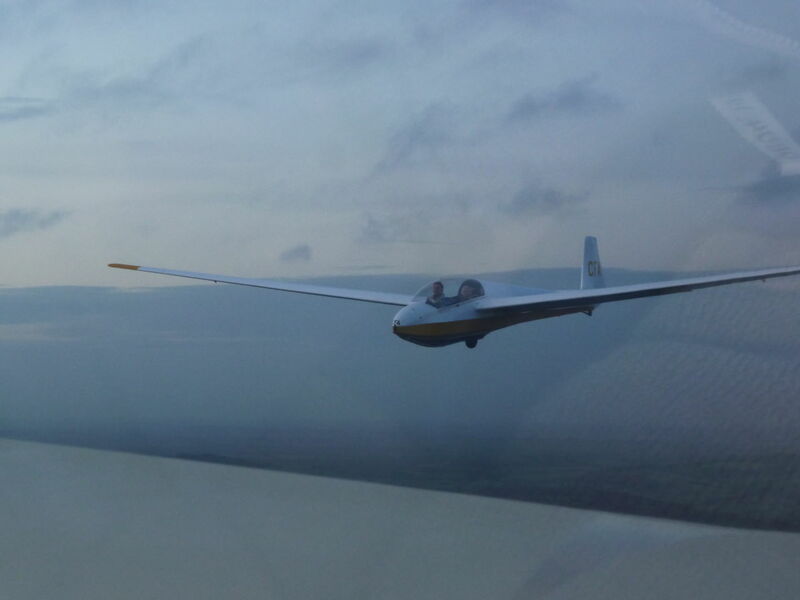 we have updates on two of the cadets who have been doing some flying elsewhere. 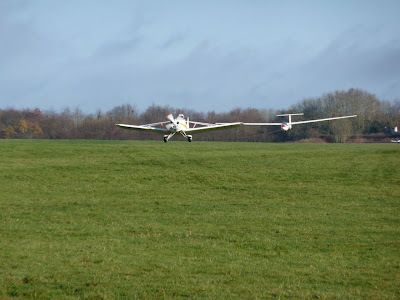 MiniGat has been doing some flying with Nottingham University Gliding Club. He had shared some concerns about the 'challenges' that winch launches offer but received the sage advise from one of his fellow cadets to 'just man up and do it'. Clearly the advice and his natural ability had him solo on the winch the same day. 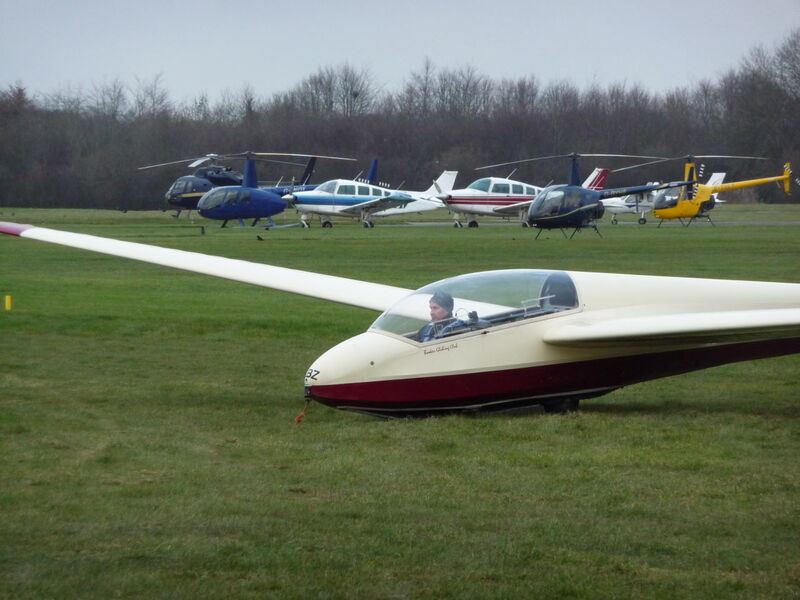 MiniGat is now cleared to fly the clubs hot ship - a Skylark II but his abilities were not missed as he was also approached the same afternoon to buy a half share in an LS6. Hilton Junior has been off at Halton doing an Air Cadet Gliding Scholarship and was sent solo on a Grob G109 motor glider earlier today. Both of them report how they have had to behave in a way that is becoming of the respective clubs operations but they are still "Booker boys" at heart! Patience finally rewarded, we got some wave on Friday. Not classic easy Aboyne wave, the northwesterly was very unstable so conditions changed rapidly, but we gave it a go. A couple of people got to 7000ft or so, and it would have been possible to go higher, but the gaps kept opening and closing. Finally we were defeated by a big shower and had to derig the entire fleet in pouring rain. Denis had set off for Fort William to have a look at Ben Nevis, but unfortunately it was covered in cloud, and so was everywhere else. 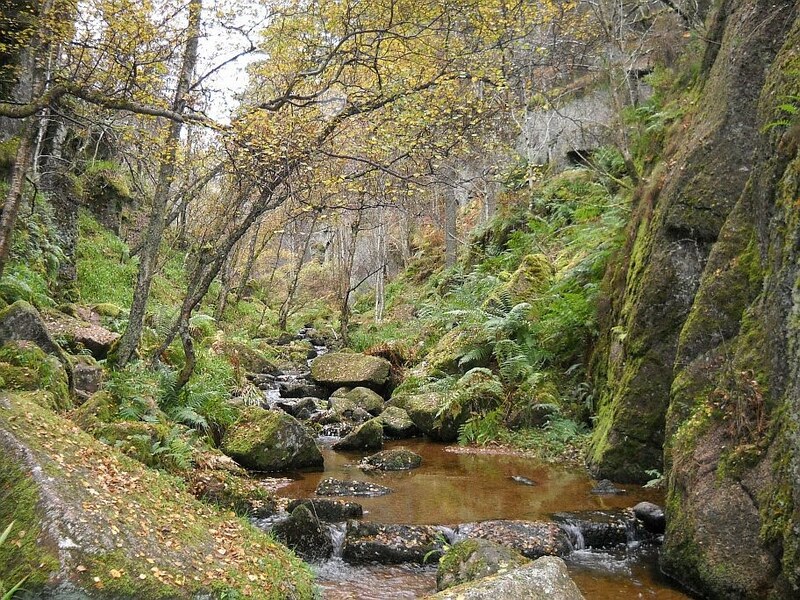 He ended up in Perth, and Roland and Richard Crockett earned themselves a lot of retrieve credits for their drive over Glenshee and back to fetch him. 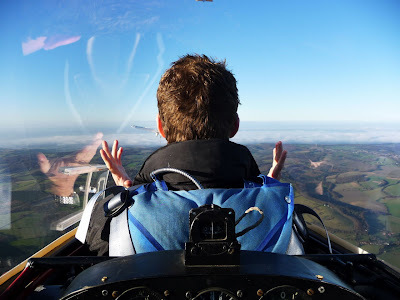 The three newcomers to Aboyne didn't get to see the best that it can offer, but they all agreed that they had widened their experience considerably with all the different types of flying, and will all be back for more. Many thanks to Deeside Gliding Club for their hospitality once again. Wednesday was a bit grey and the wind was westerly, not enough to produce wave but OK for circuit practice. We finished the day back at Birkellun with a delicious Thai curry cooked up by Richard Crockett. 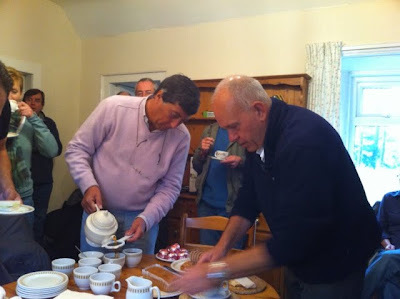 Dessert was apple crumble and ice cream provided by Denis. And the evening finished with the whisky that was on offer at the Co-op. Yesterday the wind blew northwesterly, but not with quite enough effort to produce noticeable wave. 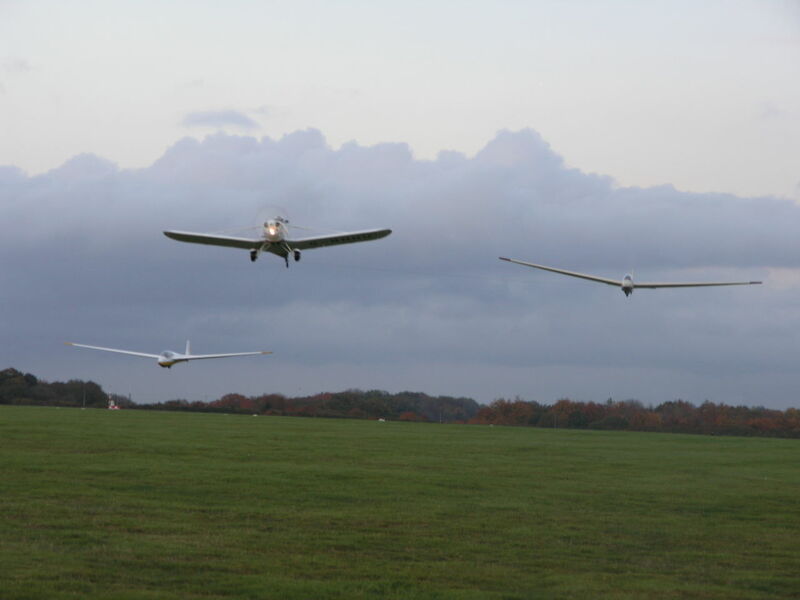 We rigged and everyone flew, mainly on ridges, but a couple of people got into weak wave for short periods. Mike and John were low enough ridge running to startle some deer. All good fun, and certainly different from the flat lands of Booker. Monday night was cold and clear, the sky was full of stars, the Milky Way was quite a sight for us southerners used to the light pollution of big towns. Tuesday dawned misty, and remained that way, so we turned into tourists. One group went to the Speyside Cooperage Centre to find out about the making of barrels. They then moved on to the Glenfiddich distillery to sample the stuff that goes into them. 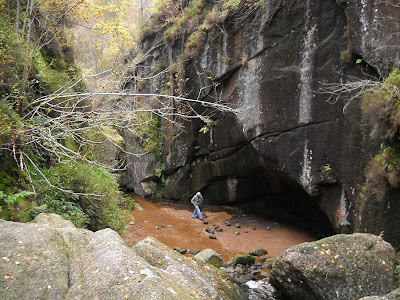 Another group went for a walk up Burn O'Vat, a local beauty spot. The young ones went cycling, along the disused railway track from Aboyne to Ballater and over the Cambus O'May forest trails. There was also a fair amount of eating going on, the courgette and Stilton soup in the Black Faced Sheep was very good, unfortunately the cheese scones had all gone by the time we got there. As the sun dropped, so did the temperature, and the mist came up from the river as if the tide was coming in. Most people went to the Boat in Aboyne for dinner, where the fish and chips and the steak pie are particularly good. Then back via the Co-op for Mackies ice cream and chocolate to be consumed back at Birkellun with some of Denis's whisky. The helicopter entertainment failed despite Henry's best efforts. The cloud refused to break yesterday, so we set off in various directions to sample the delights of Deeside. The lunch offerings at the Black Faced Sheep are second to none, the goats cheese and tomato bruschetta can be particularly recommended. There were several separate expeditions to Loch Muick for the 8 mile walk around the shore, which gave us an appetite for tea and cake back at Birkellun, where we are now all comfortably installed. Others went to the whisky castle at Tomintoul, and to visit Corgarf castle (actually a fortified house). In the evening a brave band set off to the Co-op to buy dinner for 12, which was excellent, and the evening was rounded off with a taste of Denis's whisky. 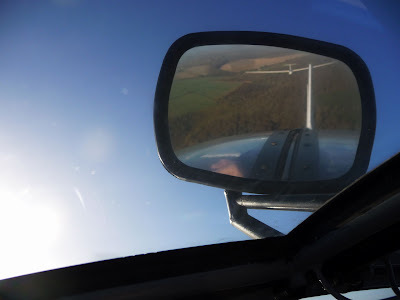 Today we hope for blue sky and a chance for the newcomers to practise circuits and get a feel for the local scenery. The southerlies have now given way to easterlies, which is unfortunately the only wind direction which doesn't produce wave, there being no hills in that direction. 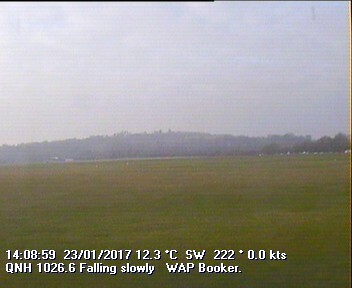 What it has brought is damp grey weather, which we hope will clear later to give us some thermal soaring. However, there is still plenty to do. On Friday those staying at Clearfield hosted a tea party for all club members, plus Phil the tuggie who is towing for Deeside GC during the wave season. There were plenty of dainty sandwiches, plus cakes provided by the guests, including some typical Scottish delicacies. Yesterday there were a number of trips. One party went to sample the local whisky and find out just how much water to put in a dram. Steve and John went off to Aberdeen to buy electric socks, after which the toys came out and model cars were soon screaming up and down the runway - until Glyn's stopped rather smartly in a puff of smoke. When they took it apart the conrods came out in bits. Later that evening the Victoria Restaurant at Dinnet provided an excellent dinner, well worth a return visit. Denis has mentioned roast chicken, though no clear promise to cook it. We will have to see how many cooks we have staying in Birkellun this week. If anyone is interested in hosting a WeatherCam towards the West (Ridge?) then please let me know. The hoped for weather we had on Wednesday failed to materialise. 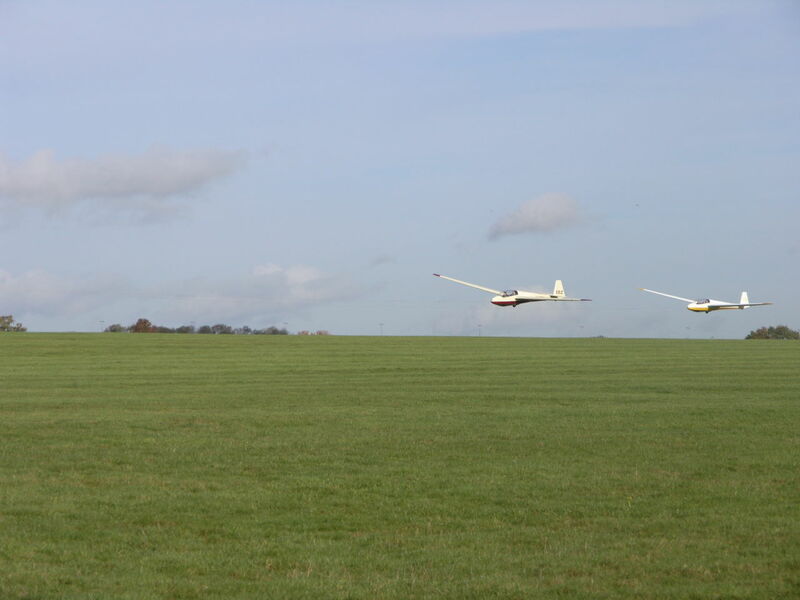 The wind had gone round to the southeast, it was mild, very pleasant and there was some soaring for those that took to the air. We had visitors from BBC 4 Science. Both the presenter and producer flew with their recording equipment and our curios neighbour Red Kite provided additional interest by joining our thermal. 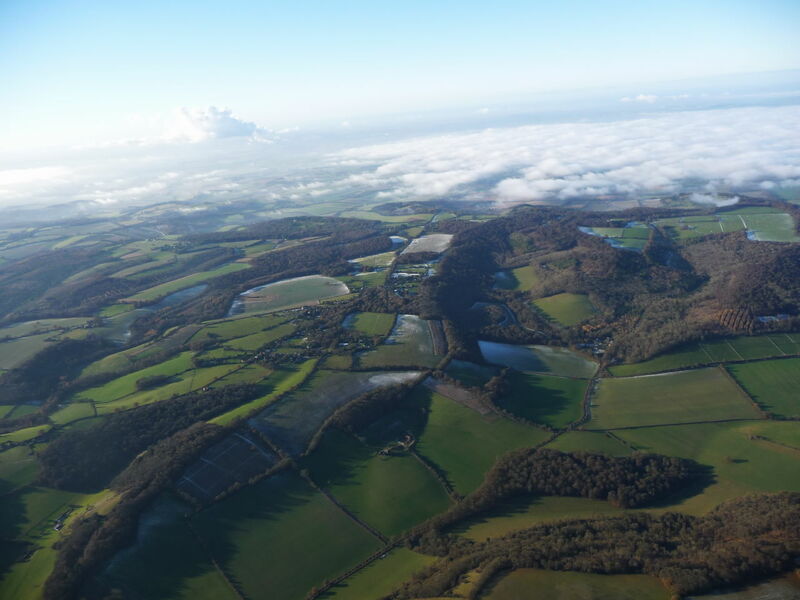 The BBC are making a three part series on the atmosphere called ‘Thin Air’ which is due to go out second week of January, further details to follow. Glyn, Mike, John and the other Richard went biking. 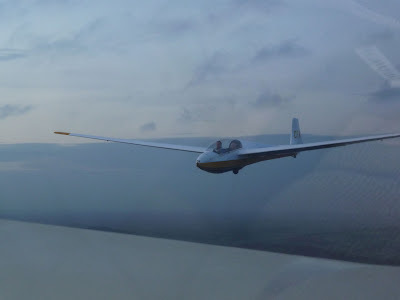 …meanwhile back at the ranch the front went through earlier than expected leaving us with nice crisp air, 12kts south westerly, 18 degrees, 2-4 octas, 3500ft cloud base, good 3kt climbs and a 4-5 hour window. Superb. Thursday looks good too.